What you probably are experiencing is called venting, or gassing. The is a normal occurrence when your batteries are charging. You should check to make sure not leavening puddles of acid on the battery tops though. When your batteries have been overfilled with water before charging then the cells bubble out acid. 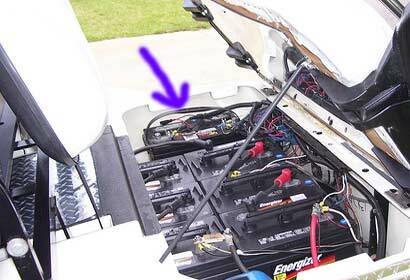 The boiling over is not good for the batteries, the battery racks and tie down brackets or battery cables and connections. If you find that acid is coming from anywhere other than the caps on top of the battery, you probably have a leak. Boiled over acid will etch and discolor a concrete garage floor, if not cleaned off with a baking soda solution to neutralize the acid.